Since I am selling my comic book collection on eBay, I keep running into interesting stuff while I am photographing them for sale. 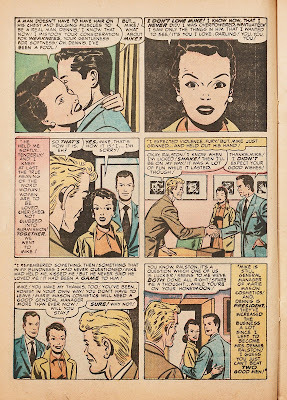 In Youn Love #18 there is a story by n artist I did not immediately recognize. But still it looked quite familiar. For me art spotting is easy. If something looks like it is possibly drawn by someone, it probably isn't. Most styles are so indicidual that you can pick them out easily. So any sort of doubt is in fact a disqualifier. But still... this story looked familiar and I looked and looked and sudenly I saw who it reminded me of. Steve Ditko. This gives me another problem. 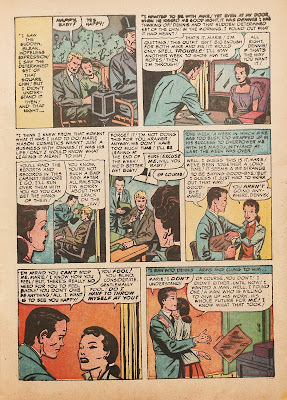 Officiall Ditko was not working until 1953, but my friend Michael T. Gilbert has recently discovered some Ditko work (what he calls his 'first') on someone elses pages in 1950. And most people agree, so it might be so. 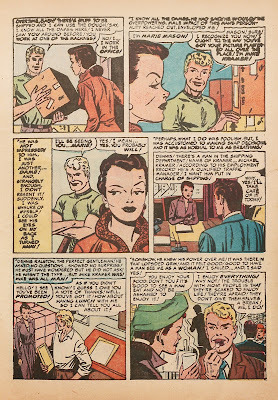 Ditko was already following night classes in 1950, so having him assist on a job as some sort of work experience is not out of the question. But... Steve Ditko is one of the most often mentioned artists when people start in the wild. Apparently, in his early yera he took on so many influences from so many artists (most notably Will Eisner, Mort Meskin and Joe Kubert) sometimes the work of those old masters (or others influenced by them, like Bob Forgione, who followed night classes alongside Ditko) looks 'like Ditko'. And thirdly, Jim Vadeboncoeur Jr. one of the best art spotters in the world, has stated that the at is in fact done by Frank Bolle. Now Frank Bolle was something of an artistic sponge, so he could do anything. 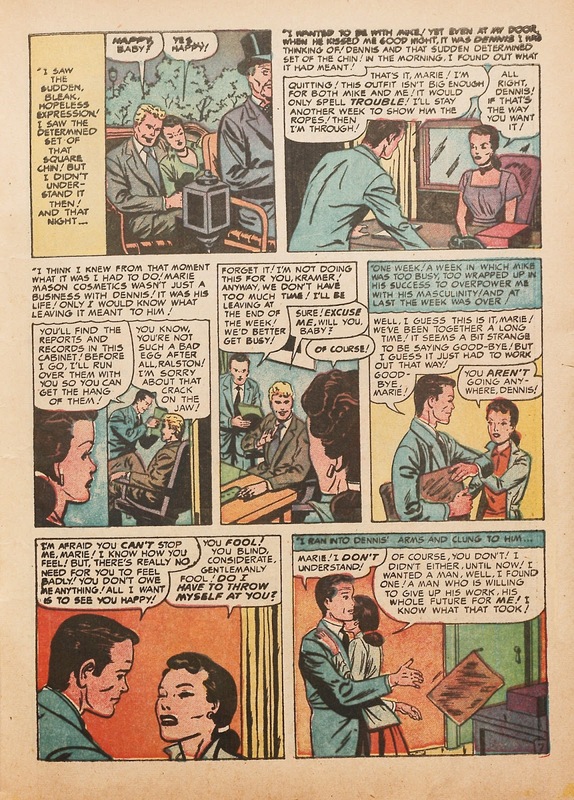 In the early fifties (this story is from 1951, by the way) he was most often working alongside Leonard Starr, who a. did a lot of work for the Prize romance books (like Young Love) and b. traces of whose work can be seen here as well. So my on the job training tells me that this is probably not by Ditko. But let me tell you which parts remind me of him anyway. 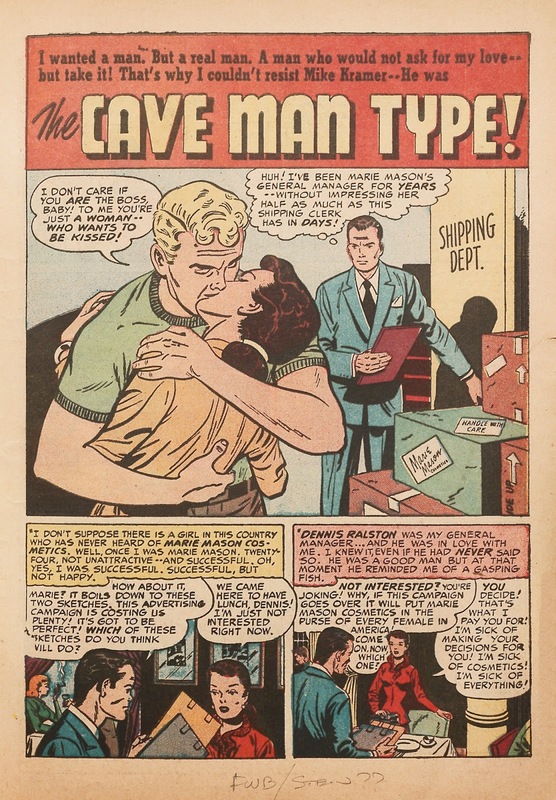 On the splash page the guy kissing the girl looks like something Frank Bolle could draw.The inking of his face is very Ditko-ish. The last two panels have that Milt Caniff light feel, that most of the work of Bolle's frequent collaborator Leonard Starr used to have. In the second page more of the Caniff light touch, but the face and posture of the guy in the last panel is lake that of some villian spotting Spiderman. Page four. No specific Ditko touches. Just a sort of stiffness that suggests we are not dealing with a routinous artist, which could be a sign of many artists. On page five, what stands out most is the punch in the last panel. 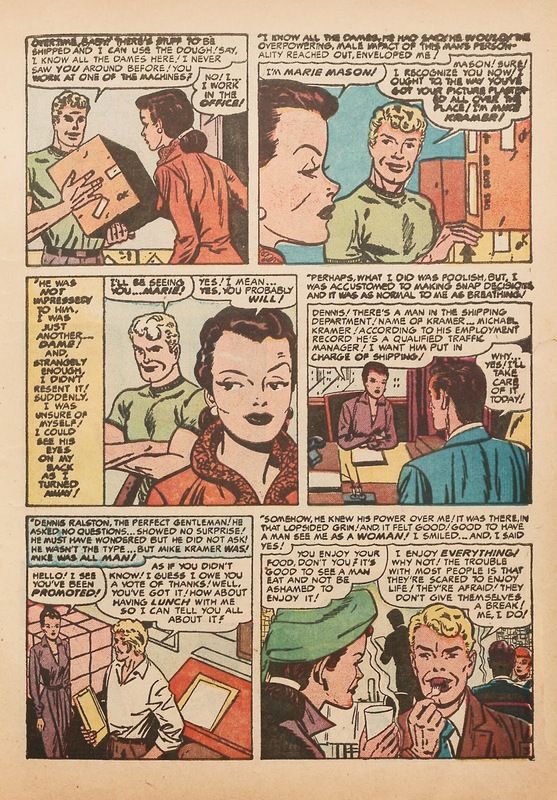 If that is not a swipe of a Jack Kirby panel, it probably is by Kirby himself. 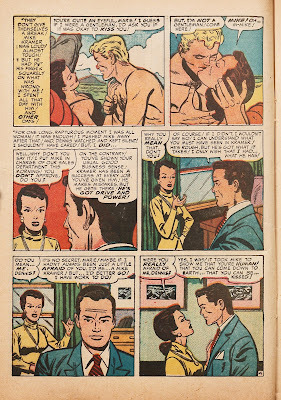 Page six.More Ditko, more Caniff light and even a bit more Kirby (the guy in the first panel). 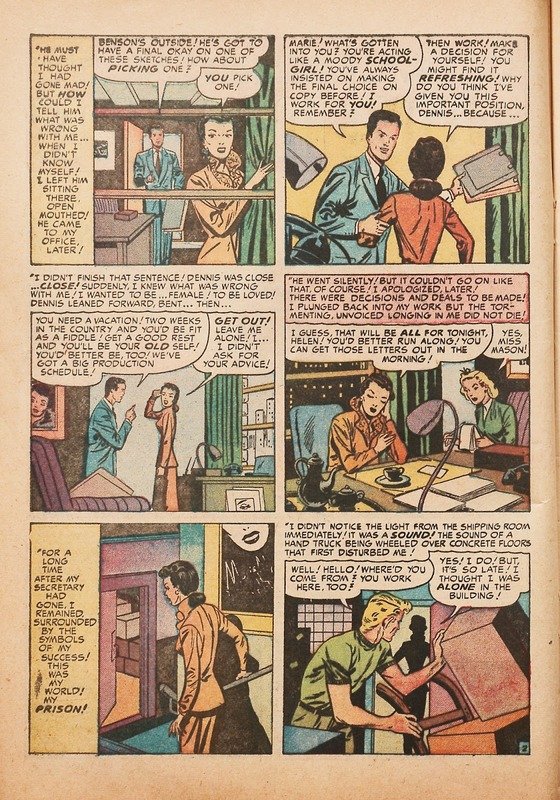 Page seven.Panel four reminds me of Ditko again. Page eight. 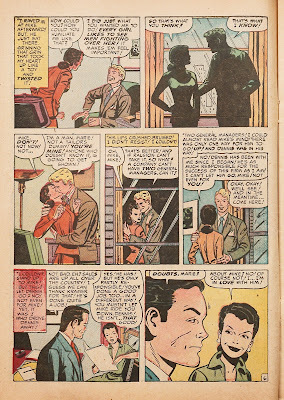 The ending of this story is the most Ditko-like of them all, with the guy giving some last advice in the last panel that could be straight out of Spiderman or Mr. A. 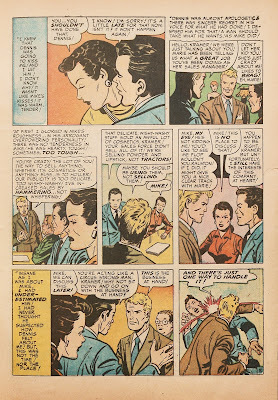 There was a Foley of the Fightin 5 story in a DC western back in 1951 that I swore was very crude Kubert or very early Ditko. Proving my point, I guess. Because that was by Kubert. I believe he did a couple. At one point I collected them all. And I wouldn't call them crude. 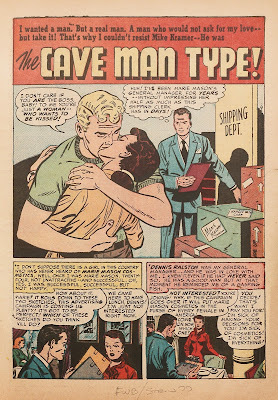 Kubert had a very heavy inking line, which is even more visible in his scarce horro work in the late forties and early fifties. As much as I respect his later work, that thick inking he did early on just touches me. Looks like some Kirby touch-ups, maybe the Ditko-ish stuff is Meskin. I think you are right about the Kirby touch-ups, although I would not call them touch-ups (which were always a lot more heavyhanded) but repairs or even redo's. Not only the panel with the punch, the one before that with the girl looking up as well. I don't think Meskin was involved. He was always way more visible, when he jumped in. So it is stll possible this is an amateurish job, repaired by Kirby and maybe someone else at the studio. I briefly considered if it could have Kirby lay-outs, but again, it is not obvious enough for that.